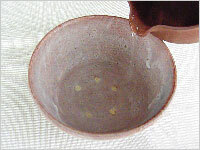 Tea came to Japan from China during the Nara period (AD 710 – AD 794). It was introduced as a health tonic. The custom of drinking tea for medicinal purposes was soon embraced by the upper classes. 300 years later, Yousai, a Buddhist master brought back seeds of tea from China and re-introduced tea as a secret potion for longevity. Yousai incorporated drinking tea with the practice of Zen Buddhism and because of this he is recognized as the founder of the tea ceremony. 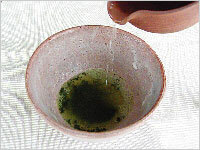 Zen is said to be healing to the human spirit and the tea ceremony is a part of Zen practice. 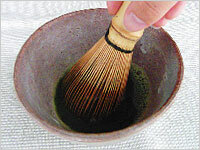 Enjoy Matcha at home for your own Zen experience. 1. Pour hot water into a cup to warm it. Discard the water. 2. 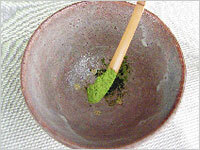 Add one and a half heaping teaspoons (2g) of Matcha tea powder into the cup. 3. Pour 1 cup of hot (not boiling) water into the cup. 4. 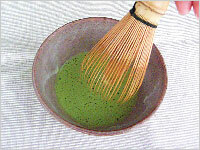 Hold the cup with your left hand and mix the water with the Matcha by moving your whisk as if you were writing the letter “M” quickly. 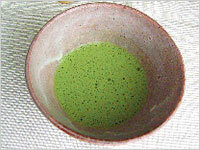 Repeat several times until the Matcha has dissolved completely and is slightly foamy. 5. After all is mixed well and the brew is foamy, remove the whisk slowly and in a circular motion as if you were writing the letter “O”. 6. Place the cup on the palm of your left hand, keep hold of the cup with your right hand and sip.